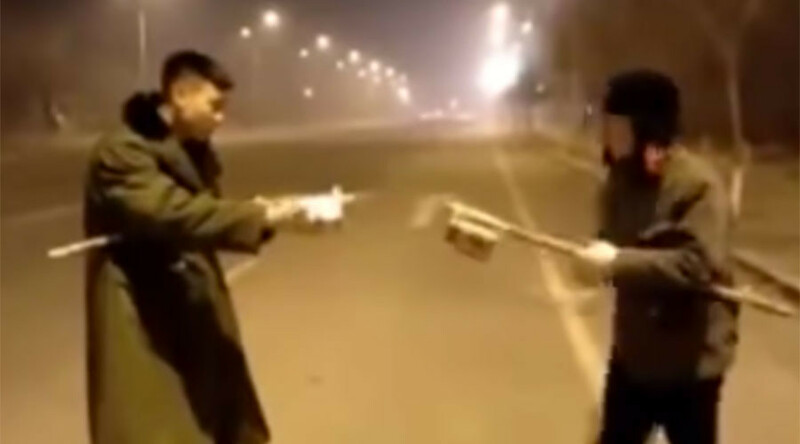 While many may celebrate the New Year with a few drinks or a party with family and friends, these two Chinese men took a different, more expansive approach to their celebrations at the end of January - a fireworks fight. The explosive fight was captured on camera and uploaded to Twitter by Chinese outlet People's Daily on Monday. The two men can be seen shooting fireworks at each other on an empty street while only standing a few meters apart. Numerous explosions can be heard in the short video as fireworks shoot back and forth between the two unidentified men. @PDChina@HarryPotterFilm I'm sending a card....what burn unit are they in? The two can be heard shouting and laughing as the video concludes, although it’s not clear if either of the men sustained any injuries during their explosive escapade.